This technology helped to sustain our family farm that was started with my grandfather. My grandfather was a farmer of cucumbers, beans, bananas, hogs, and dairy. These crops weren’t always producing well, and when my dad returned from the Air Force, he went to the farm and wanted a crop that could produce income all year round. Papayas were the crop of choice. He worked closely with the UH plant breeders to develop his own variety known as Kamiya papaya. My dad’s goal for farming was to grow a high quality fruit that people wanted and, sure enough, he created his fan club. My dad was able to farm for some two decades before the ringspot virus started to create a slow death of his farm. He knew that technology could offer hope for continuing his farm and, as a result, he was an early adopter of it. His customers wanted the papayas again and continually checked in to see when it would happen. 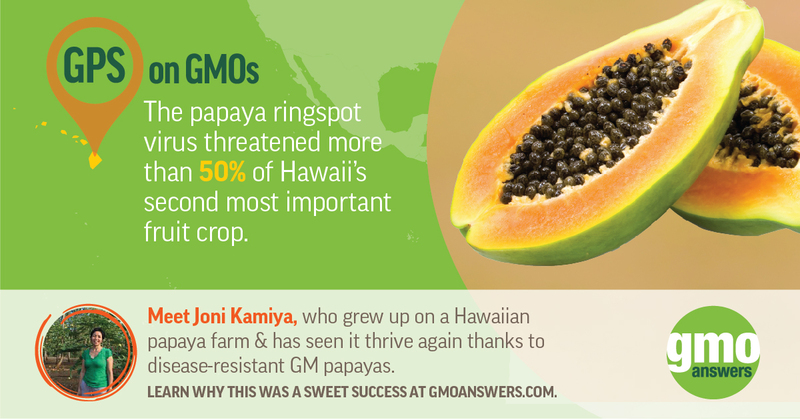 By the late 1990’s, GM papayas were being grown and consumers started buying it again.